Here on this volume 10 from Cyprien Katsaris on his own label ‘Piano 21’ are three previously released Liszt works for orchestra and piano. Katsaris the Franco-Cypriot pianist and composer created the label on the first day of the twenty-first century, hence the name ‘Piano 21’. In this archive series Katsaris explains how he aims to strike a balance between the standard repertory and less frequently heard works that he feels should be better known. The first work the Hungarian Fantasia a warhorse of the repertoire has been often recorded. The attractive Wanderer Fantasia is a score less frequently encountered on disc. A composition of uncertain authorship the Concerto in the Hungarian Style was orchestrated by Tchaikovsky and is evidently being given its première recording here. Biographer Rich DiSilvio holds the view that Liszt was, "one of the most awe-inspiring figures in all of music history." Although best known as the greatest virtuoso pianist of all time Liszt’s genius extended far beyond piano keys. Liszt was also a major influence as a progressive who according to biographer Cecil Gray created, "some of the greatest and most original masterpieces of the nineteenth century." A highly prolific and versatile composer, Liszt produced approaching eight hundred scores covering most genres of which about half were piano compositions. The first work on the release the Fantasia on Hungarian Folk Themes for piano and orchestra (Hungarian Fantasia) S.123 is by far the best known of these three scores. During work on his Symphonic Poem No. 9 ‘Hungaria’, S.103 between 1848 and 1854 Liszt was inspired in a wave of nationalist fervour to compose his Hungarian Fantasia from his Hungarian Rhapsody No.14 for solo piano, S.244. Musicologist David Ewen has written how the Hungarian Fantasia, "spills over with sensual Hungarian melodies, fiery rhythms, and contrasting moods." I find the often bombastic Hungarian Fantasia an interesting work technically and far more fascinating than it would at first appear. My understanding is that Liszt uses two major themes and a third less significant one, all in various guises and recurrently in large blocks. I estimated that the heroic, almost martial opening theme is employed roughly twenty-two times overall, including around eighteen times in the first five minutes alone. Liszt also uses the theme to close the score in a spectacular fashion. The second major theme, a jaunty merriment of a gypsy-style Hungarian folk dance, is heard in a central block of around twenty-five repetitions. In short I experienced the Hungarian Fantasia as frequently coarse and overblown, sometimes brash and over-scored but always absorbing and often thrilling. The Concerto in the Hungarian Style, S.714 is evidently being given its première recording here. It is a work that I have yet to see in a concert programme. The score has a convoluted history with its authorship by Liszt continuing to be questioned. It is often attributed to his pupil the German concert pianist and composer Sophie Menter as her ‘Ungarische Zigeunerweisen’. Whoever proves to be the true composer it seems that after Liszt’s death Sophie Menter entrusted the piano score to Tchaikovsky who in 1892 made an arrangement for piano and orchestra. Miss Menter then performed the completed score in Odessa with Tchaikovsky conducting in 1893. I experience the Concerto in the Hungarian Style as an effervescent if unremarkable work. At 0:14-0:30 and again at 0:47-1:02 one notices a theme that sounds like the tune to El Cóndor Pasa the popular Peruvian song based on authentic Incan folk melodies. The brilliant piano writing dominates the score right from the entry of the piano at 1:13. The similarities here of Tchaikovsky’s orchestration to that of his piano concertos is marked, although the relative brashness of the themes at his disposal seem alien to the refined character of the Russian composer. The brass fanfare at 12:56 heralds the closing pages where the piano plays at breakneck speed in a madcap race to the finishing line. The final work on the release is the sparkling Wanderer Fantasia in C major. Liszt transcribed the score in 1851 from Franz Schubert's four movement piano piece the Wanderer Fantasia or Wandererfantasie, D. 760 of 1822. The Wandererfantasie takes its title from the renowned Schubert’s song ‘Der Wanderer’ (1819). A great admirer of the music of Schubert, over the years Liszt produced numerous arrangements of his scores. If my estimate is correct he arranged more Schubert works than those of any other composer. Certainly the reputation of the songs of Schubert was greatly assisted by the liberal advocacy of Liszt’s piano transcriptions. Liszt’s Wanderer Fantasia is different in many respects to Schubert’s original piano score and according to Humphrey Searle manages, "in a curious way to stay faithful to the spirit of Schubert." It could be viewed that Liszt’s arrangement of the Wanderer Fantasia is the nearest approximation there is to a Schubert Piano Concerto. The booklet notes inform us that Liszt’s arrangement was first performed in Weimar in 1851 by the Austrian partnership of pianist Julius Egghard (Count Julius Hardegg) and conductor Joseph Hellmesberger. The four movements of the Wanderer Fantasia are played without interruption commencing with a rousing episode for full orchestra with the piano making a prompt entrance at 0:28. I found the sonata form opening movement marked Allegro con fuoco to be noble with a mournful and tender Adagio where the theme of the song is given several variations. The Presto movement, a vivacious Scherzo contains, between 8:01-8:20, a short tempestuous episode evocative of a howling wind. I especially enjoyed the final movement a stately Allegro with its highly effective bravura ending. Cyprien Katsaris clearly believes in these Liszt scores displaying considerable empathy throughout this eventful journey. The talented Katsaris negotiates Liszt’s often haphazard approach from the overblown to the spiritual, from the superficial to the dramatic and from the commonplace to the inspirational. He is a bold performer providing an impressively dramatic vigour in these fresh and alert performances. These often intrepid scores are clearly not the best examples in the repertoire to demonstrate his aptitude for poetic and sensitive playing. Nonetheless these are characterful interpretations with a sense of freedom and spontaneity; not only that: there’s an impressive onward flow, with no sense of exaggerated expressiveness. Ormandy and the Philadelphians provide lively and enthusiastic support. The digital recorded sound from 1981 at the Old Met, Philadelphia is of a good standard. I was especially pleased with the satisfying balance achieved between soloist and orchestra. The booklet notes from Rémi Jacobs provide all the essential information. I am not too familiar with the alternative recordings. However, there are well regarded accounts of the Hungarian Fantasia and the Wanderer Fantasia from pianist Michel Béroff and the Leipzig Gewandhaus Orchestra under Kurt Masur on EMI 5 69662-2. Pianist Jorge Bolet is worthy of considerable attention in any Liszt repertoire and many judges greatly admire his accounts of the Hungarian Fantasia with the LSO under Iván Fischer and the Wanderer Fantasia with the LPO under Sir Georg Solti on Double Decca 458 361-2. The Concerto in the Hungarian Style has been recorded by Leslie Howard with the Budapest Symphony Orchestra under Karl Anton Rickenbacher as Volume 53b of the Complete Piano Music of Franz Liszt on Hyperion CDA67403/4. 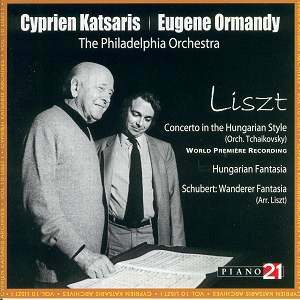 These Liszt performances from the Cyprien Katsaris Piano 21 label are probably not for the mainstream listener. This well performed and recorded disc will mainly appeal to Liszt specialists and the adventurous collector. For those wishing to explore beyond the more usual genre of the Liszt solo piano works and symphonic poems I have listed below a number of works from my collection that have provided me with considerable enjoyment. These are I feel all fascinating and rewarding Liszt recordings that can be obtained with reasonable effort. I have indicated those that I recommend especially highly. Revised 20/06/07. Klára Takács (alto); Veronika Kincses (soprano); György Korondi (tenor); József Gregor (bass); Budapest Symphony Orchestra; Hungarian Radio and Television Chorus conducted by János Ferencsik. ADD, recorded circa 1977 on Hungaroton HCD 11861-2. Veronika Kincses (soprano); Klára Takács (alto); Dénes Gulyás (tenor); László Polgár (bass), Péter Hidy (violin); Budapest Symphony Orchestra; Hungarian Radio and Television Chorus conducted by György Lehel. ADD, recorded circa 1994(?) on Hungaroton Classic HCD 12148. Alfonz Bartha (tenor); Sándor Palcsó (tenor); Zsolt Bende (baritone); Peter Kovács (bass); Hungarian Army Male Chorus; Sándor Margittay (organ) conducted by János Ferencsik. ADD, recorded circa 1966 on Hungaroton Classic HCD 11267. Henriette Bonde-Hansen (soprano); Iris Vermillion (mezzo); Michael Schade (tenor); Andreas Schmidt (bass); Gächinger Kantorei, Stuttgart; Krakauer Kammerchor; Stuttgart RSO conducted by Helmuth Rilling. Eva Farkas (mezzo); Sándor Sólyom-Nagy (baritone); József Gregor (bass); István Gáti (baritone); Kolos Kováts (bass); Eva Martón (soprano); Hungarian Army Male Chorus; Budapest Chorus; Nyíregyháza Children's Chorus; Hungarian State Orchestra conducted by Árpád Joó. DDD, recorded 1984 on Hungaroton Classic HCD 12694-96. Budapest Chorus and Soloists, conducted by Miklós Szabó with Gábor Lehotka (organ). The cast includes the eminent soprano Éva Marton. ADD remastered, recorded in September 1971 at the Matthias Church in Budapest, Hungary on Hungaroton ‘White Label’ HRC 145 (c/w Szekszárd Mass, S8/2). The Corydon Singers directed by Matthew Best with Thomas trotter, organist. DDD, recorded at St Alban's Church, Holborn, London in 2000 on Hyperion CDA67199 (c/w Via Crucis, S53). ADD remastered, recorded circa 1989 on Hungaroton ‘White Label’ HRC 145 (c/w Via Crucis, S53). Cincinnati Symphony Orchestra, May Festival Chorus and soloists conducted by James Conlon. DDD, recorded at Cincinnati, Ohio, USA in 2003 on Telarc CD-80607. ADD remastered, recording at Symphony Hall, Boston, USA in 1976 on Deutsche Grammophon ‘Galleria’ 431 470-2.
b) Rotterdam Philharmonic Orchestra, Men's Chorus of the Slovak Philharmonic, Bratislava conducted by James Conlon, with John Aler (tenor). Rotterdam Philharmonic Orchestra, Choeur de Concert de Helmond conducted by James Conlon. DDD, recorded circa 1986 on Warner Classics ‘Apex’ 0927-49816-2. 1) Piano Concerto No.1 in E flat major, S.124, R.455, (1830-49, rev. 1853 & 1856). 2) Piano Concerto No.2 in A major, S.125 (1839-40, rev. 1849 & 1861). 3) Totentanz (Dance of death), Paraphrase on the ‘Dies irae’ for piano and orchestra, S.126, R.457, (1849, rev. 1853 & 1859). DDD, recorded Lukaskirche, Dresden, Germany 1994.
adapted from Franz Schubert's Wanderer Fantasia (Wandererfantasie) for solo piano in C major, D. 760 (1822). based on Liszt’s Hungarian Rhapsody No.14 in F minor for solo piano, S.244). after Carlo Maria von Weber’s Polonaise (Polacca) brillante for piano, ‘L'hilarité’, J. 268, Op. 72 (1819) and introduction from Grande Polonaise for piano, J. 59, Op. 21 (1808). 9) Malédiction, concerto for piano and strings orchestra, S121 (sketched circa 1830; revised circa 1840). .
All the above 11 Concertante Works are contained on a 4 disc set from Brilliant Classics 99936. DDD, recorded 1981 at Old Met, Philadelphia, USA on Cyprien Katsaris’s own label Piano 21, Cat. No. P21 022-A. Julia Hamari (mezzo); István Gáti (baritone); Gérard Garino (tenor); Katalin Farkas (soprano); Iidiko Komlósi (mezzo); Hungarian State Opera Orchestra & Hungarian Radio and Television Chorus, conducted by Tamás Pál. DDD, recorded circa 1986 on Hungaroton HCD 12744-45-2. ADD remastered, recorded at Abbey Road studios, London 1979-80 from EMI Classics 5 73836-2 (c/w Lieder Schumann & Mendelssohn). DDD, recorded at Rice University, Houston, Texas, USA in 2002 on Bridge Records 9187 (c/w Chopin: Cello Sonata, Op. 65; Polanaise brillante, Op. 3 & Grand Duo Concertant).